Old Meadows Park at 1600 Marview Drive, Thousand Oaks houses the Therapeutic Recreation Unit of the Conejo Recreation and Park District, which provides recreation programs for Conejo Valley residents with disabilities. There is an existing special needs playground at the park but the playground needs to be expanded and refurbished. The popularity of this playground has steadily increased due to expanding awareness of the playground and its special features, the steady rise in incidence of autism. Currently, there is opportunity to increase the square footage of the playground at Old Meadows Park. The Rotary Club of Thousand Oaks Sunrise is spearheading the effort to improve, modernize and expand the playground. 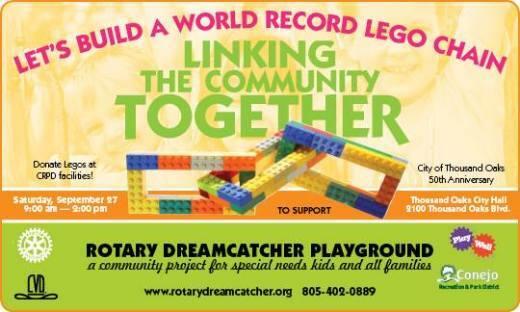 Through careful research and a survey of the special needs community, the Rotary DreamCatcher Playground will be designed with great sensitivity to the needs, comforts and inclusion of special populations and their families. The playground will include active and passive play areas allowing children to engage in stimulating activities, and areas to which they can retreat and calm themselves after anxiety-producing experiences while remaining close by to other children, parents or caregivers. The goal is to raise $500,000 through funding partners and fundraising activities with the project completed in phases by 2016. Would you like to learn more about this effort and find out how you can support it? Visit www.rotarydreamcatcher.org. Arts and teen programs will benefit from a major monetary donation. Janss Marrketplace management presented a $1,5000 check yesterday to representatives from the Conejo Recreation and Park District (CRPD) in a ceremony held at the shopping center, located at located at 215 North Moorpark Road in Thousand Oaks. A free "Pet Pantry" program is open every Sunday in the east county due to the generous outpouring of donations that Ventura County Animal Services (VCAS) has received from private residents, and regular contributions by local merchants including Wal-Mart and Do It Center. The Simi Valley VCAS Pet Pantry is located at: 670 W. Los Angeles Avenue, Simi Valley on Sundays from 10:00 a.m. to 11 a.m. or when supplies run out. The Camarillo VCAS Pet Pantry is located at: 600 Aviation Avenue, Camarillo, Sundays from 10:00 a.m. - 12 noon or when supplies run out. VCAS is accepting donations for this program, including cash, pet food, accessories and supplies. Volunteers are needed to run the Pet Pantry Program, particularly at the Simi Valley location. Interested individuals can contact the Animal Services Volunteer Coordinator at VCAS.Volunteer@ventura.org or call 805.388.4341. Multiple arts and teen programs will benefit thanks to a major donation from Janss Marketplace, which will be presented during a ceremony tomorrow, Friday, November 19 at noon at Janss Marketplace, located at 215 North Moorpark Road in Thousand Oaks. The public is invited to attend the ceremony with leaders and families served through the Conejo Recreation and Park District and the Arts Council of the Conejo Valley. Janss Marketplace will present a $10,000 donation, which the center raised in just nine days from proceeds during the October Reign of Terror Haunted House. The Reign of Terror not only ranked as one of the top 10 Haunted Houses in the U.S., but also provided the center with the opportunity to donate much needed funds to the organizations. The Thousand Oaks Teen Center is operated through the cooperative efforts of the Conejo Recreation and Park District and the City of Thousand Oaks. The program benefits teens by providing a full service activity center and recreational programs. The Janss Marketplace donation will help fund programs and purchase computer and sports equipment. Janss Marketplace is professionally managed by NewMark Merrill Companies, LLC, which is owned by President and Chief Executive Officer, Sandy Sigal. Since 1984 he has led NewMark Merrill in a community leadership role at the company’s shopping centers in more than 36 cities. For more information about the center, visit www.janssmarketplace.net or become a fan on Facebook. For more information about the Conejo Recreation and Park District youth programs, contact Steve Wiley at 805.495.6471.